Image: Jason Mendez/Getty Images, Alberto E. Rodriguez/Getty Images. Design: Allie Gemmill/SheKnows. In the latest soul-baring episode of Jada Pinkett Smith's popular Facebook series, Red Table Talk, she ended a feud with fellow actor Leah Remini. 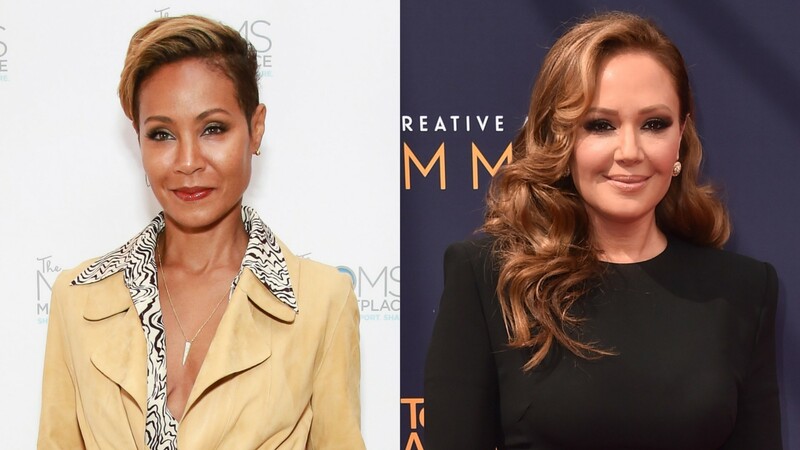 The women had a dramatic falling out in the past over Remini’s comments about Pinkett Smith’s alleged involvement in Scientology. When Remini arrived to the titular red table, though, she and Pinkett Smith affectionately hugged and complimented each other before diving into their troubled history. So, what brought the stars — who met two decades ago — to this point of nearly no return? In her 2015 memoir, Troublemaker: Surviving Hollywood and Scientology, Remini referenced Pinkett Smith when describing a Scientology event. According to Remini, at the event in question, noted Scientologist Tom Cruise allegedly suggested the guests play hide-and-seek. Remini, who found the idea of adults playing hide-and-seek to be strange, tried to decline. In telling this anecdote, she claimed Pinkett Smith was one of the other celebrity guests in attendance, implying she was regularly involved with the Church of Scientology. Pinkett Smith downplayed the incident during a later appearance on Watch What Happens Live with Andy Cohen, insisting hide-and-seek was more intended for the small children (including her own) at the event. Pinkett Smith also went on to explain in a series of tweets that she wasn’t a Scientologist but had studied the religion. “It upset me because I didn’t understand why we had to be in your book because we really didn’t have anything to do with this,” Pinkett Smith told Remini, adding that she was hurt by the betrayal. In that vein, Pinkett Smith addressed her comments on Watch What Happens Live. But Remini also revealed she had been upset by Pinkett Smith’s appearance on the show. “When I saw it, I was hurt, because I was like, ‘Oh, she’s in [the church],'” she said. As for whether she is or is not a Scientologist, Pinkett Smith pretty much laid that mystery to rest too. Pinkett Smith then reiterated she has no interest in being a member of the controversial church. To which Pinkett Smith responded, “It’s OK. I love you anyway” — and Remini echoed the sentiment. Now, if we could just get Pinkett Smith to work her Red Table Talk magic on the rest of the world’s turmoil….